Not intentionally, but we can imagine him mumbling about getting it over a wall. Special edition cars are created for any number of reasons, to celebrate the launch of a model, the death of a model, or a record amount of sales. 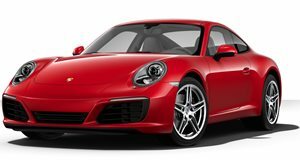 This Porsche Carrera S is a special one that's been created to celebrate an anniversary, that being Porsche's time officially operating in Mexico, which is now on 15 years. The car features a host of small changes that link back to being a special Mexican version of the car. They're subtle, but also easy enough to spot so that you know you're looking at something special. Above the glove box on the aluminum strip we find "15th Anniversary Porsche Mexico" engraved, but the coolest piece is the door sills that, along with the 911 Carrera S wording, also features the 15th Anniversary message, flanked by the Mexican flag. On the exterior we know it's a special car thanks to stripes over the top and along the lower section of the doors in red and green, the colors of the Mexican flag. The car is a one-off for now, which will likely be auctioned off in the future to raise money for charity, but next year we could see Porsche of Mexico put together at least 15 special edition cars so that loyal customers will be able to add one to their collection, if Nivel-C has it right.